Recently I have come across a couple of pieces of Technology that Make life as a consultant much easier. I thought I would share them with you. Use F3 to search a webpage. When you are on a webpage (this includes the back end) you can press F3 and it will pull up a dialog box that allows you to search that page. This is great for managing your team, finding an order, or a customer e-mail. GPS Navigation: Okay so everyone knows how great GPS navigation is, unless of course you have never used it. My husband got it for me right after I became a consultant and I LOVE it. No more getting lost on the way to a party. If you are doing a lot of parties outside of the area you know well, than this is a must have. Program the Tax Rates into your Calculator: In case you haven’t noticed I am NOT a math whiz. Sales tax and food tax sometimes trick me up. If you are the same just program the tax rate into your calculator (or have your math whiz husband do it). Than all you have to do is push on button and the tax is figured out for you. Online Catalog This is very helpful to add to you blog, or to e-mail to customers. I send it to party hosts, potential consultant, okay well everyone. I like it because it allows customer to see the products. Food Calculator (also Called THRIVE Planner): I like setting up planners from the front end because then you can e-mail it to a customer and to yourself. Emergency Kit Planner This allows you to create a customer emergency kit. Love it. Marketing Kit (Consultant Materials →Marketing → Marketing Kit) This will download a bunch of images and logos for your use. http://www.shelfreliance.com/fan This fan page has a bunch of easy to use buttons for your blog (or you can use them as adds) These adds/buttons are already approved and you can use them without getting approval from SR.
What technology do you use that makes things easier? Shelf Reliance has been working on establishing the home party program in Canada for quite a while and starting December 1st the NFR model is up and running. The Canadian program is a little different than that used in the United States and I know that causes a lot of questions. I’ve compiled a bunch of questions and their answers that are frequently. After reading this if you still have questions please ask. 3. 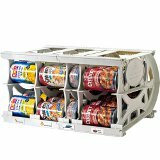 Have we finalized the answer to the question "How much Shelf Reliance product can I purchase at a time?" Will the online order page be set up to prevent oversized orders? On the doc. Yes, it will be prevented, except for Q orders. 4. Have we decided if the meat and dairy limit is one meat and one dairy per order or if it is one of each specific meat and one of each specific dairy per order? We won’t know this until our test orders go through. We will make an update at that time. 9. We listed the return policy. Is there a customs/quarantine problem shipping orders back from Canada to the US? Should we test the return process? They will be contacting Seth at this time if there is a problem at the border. 11. Are Sandy and Wade still going to run their store? Yes, all retail will continue, but pricing is higher. 13. When we opened Alaska and Hawaii there were issues with setting up Q orders. Consultants would set up a Q for an Alaska or Hawaii Customer in the regular Q set up, and then the order would get lost when switching over to Hawaii/Alaska. Apparently this was a horribly complex issue to fix and still is frustrating to deal with even now. Will this be an issue with Canada Q set-up? If so, can we fix it in the next week? (If needed, ask Shannon for details on the problem). Tested and looks fine. Q: When will Shelf Reliance Canada NFR be open? A: The official launch date is scheduled for December 1st. However, we will begin taking pre-launch orders on November 25th. Q: What does NFR mean? A: NFR stands for “not for resale.” Therefore, the NFR policy means that any Shelf Reliance products shipped from US to Canada cannot be resold. This program is designed for personal use only. Q: Does Shelf Reliance Canada have its own NFR website? Q: If I have a question how can I reach customer service? A: Questions will be directed to our corporate headquarters in American Fork, Utah. If you have a question please contact customer service at (801) 756-9902, fax at (801) 642-0906, email queries to support@shelfreliance.com, or utilize online chat from our website. Q: How can I order Shelf Reliance products? A: Products can be ordered through the Shelf Reliance Canada website www.canada.shelfreliance.com or through a consultant webpage. Q: How do individuals register to become consultants? A: Registration is done online through the consultant URL or the above website. Q: Can Canadian residents become Shelf Reliance consultants? A: Yes. Canadians can now sign up to be consultants, and they will receive all the same benefits as consultants in the United States. Q: Can Canadian consultants only sign up Canadian residents for the home party program? A: No. Shelf Reliance consultants from the United States and Canada can sign up individuals who reside in either of the two countries. This open-border policy will allow consultants to expand their business on an international scale. Q: How will Canadian Consultants be paid? A: Consultants will be paid with a monthly commission check that will be in US currency. The exchange rate for commission checks is based on the daily rate at the time when the check is cashed. Direct Deposit will not be an option at this time. Q: Will Canadian consultants have access to all the current home party tools? A: Canadian consultants will have access to most of Shelf Reliance marketing materials and online tools. You can find the pack on the Canadian Price List. However, the Shelf Reliance product catalog will not be available in Canada. Q: Will Canadians be required to have a personal Q to receive commissions? A: Yes, Canadians will have the exact same requirements for commissions as the US. Q: Will Canadian consultants have access to the Shelf Reliance Business Kit? A: Yes. Canadian consultants can purchase the Shelf Reliance Business Kit for $199.00. Shipping will be an additional $27. Local tax will also be charged if applicable. Q: What THRIVE products will be available? A: Most of the THRIVE products sold in the US will be available through NFR. Dairy and Meat product won’t be available when we start. Q: How much Shelf Reliance product can I purchase at a time? A: Shelf Reliance will be functioning as a NFR company in Canada, which means that customers will only be able to order a maximum of 30 cans per order. Q: Is there a limit to the number of individual products I can have in each order? A: Yes, once we begin offering dairy and meats, you will be limited to one can of these items per shipment. Q: Is there a limit on the number of cans for my host benefit order? A: No, this is considered a benefit rather than a personal purchase. There is no limit at this time. However, orders with product over 30 cans will need to be faxed into the company for processing. Q: What THRIVE, FRS, and emergency products will be available through Shelf Reliance Canada? 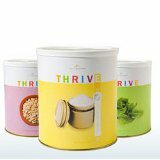 A: At this time THRIVE will be available in #10 cans and pantry cans. Unfortunately, at this time FRS and emergency products will not be available through Shelf Reliance Canada. The reason for this is the extremely high duties and taxes assessed for these products. Q: How can I find out what products are available? A: Available products will be recorded on the Canada price list which you can find in your back office. Q: How will the Shelf Reliance products be labeled? A: All Shelf Reliance products will be labeled based on US regulations. Q: Will Canadian pricing be the same as US pricing? A: Yes. All pricing will remain the same and will be in US dollars. Q: Is Home Party pricing the lowest pricing in Canada? A: Yes. If you ever come across a retailer selling the product at a lower price, you are able to match it. You will just need to send a fax to the home office to process that order. However, this should not happen because retailers have a set price higher than the home party pricing. Q: How will I receive my Shelf Reliance order? A: Shelf Reliance will be using FedEx to ship our products. A: We strive to ensure that all of our customers are pleased with their purchase. If you are unsatisfied with any Shelf Reliance product purchased in Canada, you may return the product within thirty days from the date of purchase to our home office. You are responsible for the shipping fees to return the product. Q: What if the products I ordered are on back order? A: The process for back orders in Canada will remain the same as in the United States. Back ordered items will be shipped to you as soon as the products are in stock. * You will not be required to pay any additional shipping fees for back ordered items. *If you have more than one item on back order, the back ordered items will not be sent until all back ordered items have arrived. Q: Will I be charged additional duties or taxes? A: Shelf Reliance does not control the rates assessed at the border. There is always a chance that you will be charged additional taxes and duties..especially if you purchase multiples of the same item in a package. Local sales tax will be charged at the time of purchase if applicable. Q: Can we ship product to border towns and bring product across the border on our own? A: No, this is against our company policy. This will cause termination of your consultant opportunity because of the risk it puts our company in. Q: What are shipping rates for Canadians? Q: How long will it take to receive an order once it is purchased?